https://sep.yimg.com/ay/yhst-33477391359232/disticophora-assorted-coral-distichopora-species-lace-coral-stylaster-coral-6.jpgDisticophora Assorted Coral - Distichopora species - Lace Coral - Stylaster CoralDifficultPeacefulYesCalcium, Strontium, Trace elementsIndo-PacifcStylasteridaeSmall 2" - 3"
Disticophora Assorted Coral is a rare coral that is, the coral is not found very frequently. Also, Disticophora Assorted Coral is difficult to maintain and therefore, it should be kept in an established marine aquarium under the vigil of an experienced aquarist only. Taxonomy: Disticophora Assorted Coral belongs to the Kingdom Animalia, Phylum Cnidaria, Family Stylasteridae and Genus Disticophora. 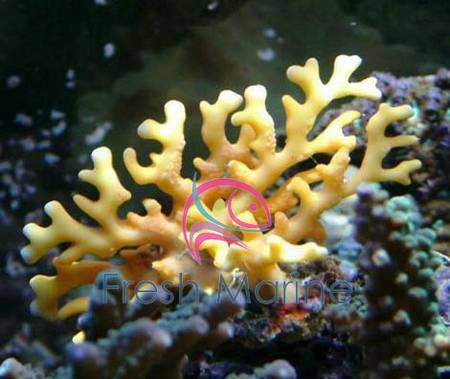 Scientific names: The scientific name of Disticophora Assorted Coral is Disticophora species. Other common names: Disticophora Assorted Coral is also commonly known as Lace Coral, Disticophora Lace Coral, Purple Stick Coral, Ember Coral and Stylaster Coral. Coral Type: Disticophora Assorted Coral is a Hydrocoral, though considered as a Small Polyp Stony (SPS) Coral at some places. Origin or natural range: The Disticophora species originates from the Indo-Pacific region. Color: Disticophora Assorted Coral occurs in purple, salmon and yellow colors and their variations and combinations. Compatibility: The Disticophora species is non-aggressive towards the other marine aquarium invertebrates. Disticophora Assorted Coral hangs itself upside down to a cave or some overhang in the marine aquarium water body it abodes. The Disticophora species is nocturnal in habit and therefore spreads itself fully at night. The appearance of Disticophora Assorted Coral may vary due to various environmental factors such as the depth of marine water where the coral exists, the surroundings of Disticophora Assorted Coral and the flow of water around the coral, to name some. The Disticophora species resembles Fire Coral, Milepora species. Disticophora Assorted Coral has a purple colored, hard exoskeleton composed of Calcium Carbonate. The skeleton of the Disticophora species has many lacy branches with blunt ends that resemble the appearance of a fan. The branches are quite fragile. The branches of Disticophora Assorted Coral have small polyps popping up from the grooves in the skeletal base. The polyps of the Disticophora species expand at night. Temperature of water: The marine aquarium hosting the Disticophora species should have a temperature ranging between seventy-two and seventy-eight degrees Fahrenheit. Specific gravity of water: The specific gravity of water in the marine aquarium should be maintained between 1.023 and 1.025.
pH of water: Keep the pH of water scaled within 8.10 to 8.40. Water flow in the aquarium: Disticophora Assorted Coral needs moderate water flow in the marine aquarium it abodes. Illumination: The Disticophora species requires low lighting in the marine aquarium it inhabits. Introduce Disticophora Assorted Coral in a well established aquarium. Place the Disticophora species at the medium level in your marine aquarium. Disticophora Assorted Coral places itself upside down in caves or any overhangs in your marine aquarium. The Disticophora species is azooxanthellae that is, the coral lacks the photosynthetic alga zooxanthellae and is therefore non-photosynthetic. Disticophora Assorted Coral is Planktivorous in feeding habit and filter feeds frequently per week, when open. The Disticophora species feeds upon acellular marine invertebrates, zooplankton and phytoplankton. Add Calcium, Strontium, Iodine and Trace Elements to the water as dietary supplements for Disticophora Assorted Coral. Care: Disticophora Assorted Coral is difficult to maintain.